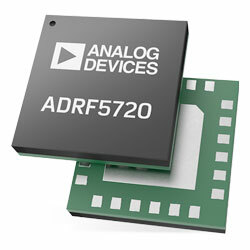 The ADRF57xx Digital Attenuators, from Analog Devices, are silicon 4-bit/6-bit step attenuators with 30dB/31.5dB attenuation control range in 0.5dB/2dB steps. These devices work in the ultra-wideband frequency range of 9kHz to 40GHz with low insertion loss and superior attenuation accuracy. The attenuators need a dual supply voltage of +3.3V and −3.3V. These devices feature SPI, parallel mode control, and CMOS/LVTTL-compatible controls. The RF ports of the attenuators are created to match the characteristic impedance of 50Ohm. The ADRF5720/30 attenuators are mutual pin-compatible and are offered in a 4mm x 4mm, 24-terminal RoHS compliant LGA package. In contrast, the ADRF5721/31 attenuators are mutual pin-compatible and are offered in a 2.5mm x 2.5mm 16-terminal RoHS compliant LGA package. Typical applications include industrial scanners, test and instrumentation, 5G millimetre wave cellular infrastructure, radars, ECMs, microwave radios, and VSATs.